In a pursuit of higher revenue, merchants seek every possibility to increase sales demonstrating wonders of marketing creativity. For instance, how many time you’ve seen highlighted products suggestions usually placed on a store’s homepage? The display of “Featured Products” panel is an effective and time tested way to bring your customers' attention to products worthy of extra consideration (best-selling, on sale, most recent, etc.) and encourage sales. Generally, the point of featured products is to ease customer’s choice. Looking at a huge number of products, a customer often gets completely lost in choice and leaves the store without purchase. However, specially highlighted products attract customer’s attention and, consequently, are more likely to be bought. Thus, today we’ll learn how to add featured products to Magento store frontend and go through every step of this procedure. We’ll start with the creation a new product attribute for our purpose. Once we’ve made changes in all the mentioned settings above, we need to save the new attribute. For this purpose, go to Catalog > Attributes > Manage Attribute Sets, and add the newly created attribute to Default attribute set. Once the new featured attribute is created, we need to get to the next step - the creation of a new block class which will feature the featured product. Congratulations! The featured products are now added to the frontend of your Magento store. Now, enable a good interface and optimize conversion rate by creating an excellent user experience for your customers! If you are willing to widen functionality, facilitate managing process and enhance shopping flow, consider upgrading Magento. Cart2Cart provides an automated migration service to move accurately and smoothly a vast range of entities between Magento stores (1.x - 2.x): products, categories, manufacturers, orders, taxes, customers, CMS pages among them. Launch an absolutely Free Demo Migration to test the service and obtain a store on the latest Magento version. 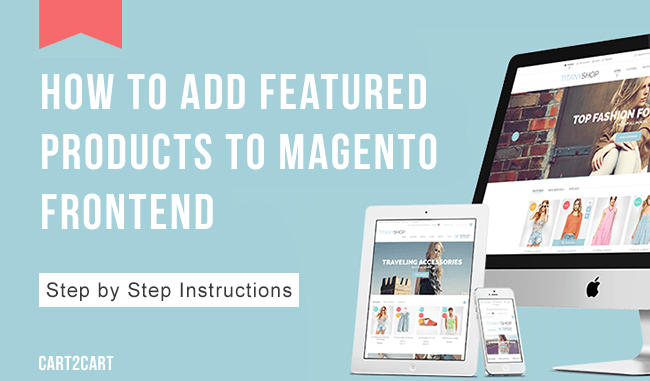 One thought on "How to Add Featured Products to Magento Frontend - Step by Step Instructions"